A black and white rendition of the North Dakota Badlands landscape. I’ve always been fascinated by sedimentary rock. I also could not keep from saying, “It’s sedimentary, my dear Watson,” to Michelle. I love their orange eyes! Print Available. Mmmm, snack time. I processed all the monochrome images in this post using Tonality Pro by MacPhun. 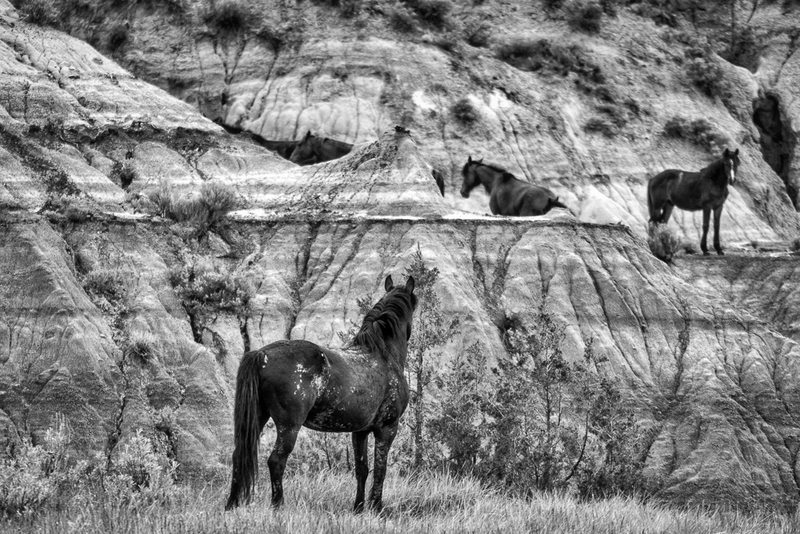 One of the highlights of the trip, by far, were the feral horses in Theodore Roosevelt National Park. We came upon this group of horses on our first morning drive of the loop road. This was the first horse we came across. It seemed to keep a distance from the rest of the herd, thought there was one other gray horse with it. This young horse was laying beside it’s mother, having a snack on the grass. Print Available. The horse herd seemed to work together as a family unit. Print Available. “Marching Orders.” Fed up with the loitering photographers, the herd decided to hike up the mountain for some alone time. Print Available. A bit later we ran into a family of deer. I wonder what these two prairie dogs were conspiring about. Print Available. This was one of my first attempts at stitching a panorama. I made this photo out of about four or five individual shots. Print Available. This entry was posted in Landscape Photography, Nature, Travel and tagged Badlands, Bison, Buffalo, Deer, Feral Horses, Horses, Landscape, North Dakota, Panorama, Prairie Dogs, Sedementary, Sony Images, Travel, Travel Photography, Wildlife. Bookmark the permalink.